The C&O Canal is restored with water as far upriver as Seneca, which was once the "head of navigation" for the entire canal. When the section of the canal from Georgetown to Seneca was completed in 1831, it was immediately opened for traffic. Today, it is again one of the few sections of the canal with water in it. Plans for canal restoration have included several types of construction, but watering the canal is an expensive process and one that requires extensive maintenance. Seneca offers boat ramps and excellent fishing. Fishermen also frequent the rapids below the old Seneca Dam at Violette's Lock, about 2 miles downstream. The Seneca Creek Aqueduct of the canal is one of the more interesting canal structures. 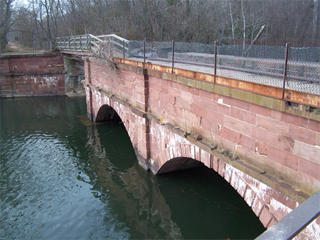 Designed to carry the canal over another body of water (Seneca Creek), the aqueduct is built of red Seneca sandstone, quarried nearby and cut at a stonecutting mill within a few hundred feet of the aqueduct. The remains of this mill are still visible immediately north of the canal. The first aqueduct to be completed along the canal in 1831, it included a canal lock, known as Riley's Lock. It stood virtually intact until a storm in 1972 damaged the upstream arch. A number of stonecutters' marks are visible on the aqueduct walls, but some historians question the validity of these marks, which can be made easily in the soft sandstone. The stone is the same as that used in construction of the Smithsonian's "castle" building on the mall in Washington. Stones for that building were carried down the canal. Several other canal locks and structures were built with this durable stone. The lock keeper's house is restored and open during spring and summer weekends, with tours provided by Girl Scouts from troops in Montgomery County.